Stonemaul is a collection of eight of my heroic fantasy short stories and novelettes. Six have previously been published, but there are two brand new ones. All are part of the Chronicles of the White Bull, the story of Nhaqosa the minotaur, with the two new stories recounting the end – and the beginning – of his journey. All up it comes to around 65000 words in total between the eight stories, and is available at Smashwords and Amazon. In The Man Who Stole the World the consequences of allowing companies to own genetic modifications is explored to the extreme. Day of the Beast looks at one possible result of not properly securing the new forms of energy we are creating. The Smartest Assassin details one possible implication of nanotechnology. In Hulo and the Stinkfruit you get to see a glimpse a particularly challenging day for an inhabitant of a barren and alien world. Flaw of Gravity is a nod to Isaac Asimov’s early SF stories, in which two scientists strive to explain a very peculiar anomaly. Finally, in the title story The Caverns of Eden, it’s two hundred years since the oil, water and food ran out, resulting in a global nuclear war. Fortunately for mankind the Norwegians had been prepared, having hollowed out deep underground caverns – the home of the world’s last city. All of these are science fiction, with the initial five stories being between 500 and 2,500 words, while the title story, The Caverns of Eden, is on the cusp of a Novelette/Novella at about 16,500 words. In five of these stories I wanted to address different aspects of the way technology is changing our lives now, and then extrapolate what they could lead to in the future, while Hulo and the Stinkfruit came about when I read about a fruit called the Durian which has an awful smell, yet people claim it tastes delicious. Do you prefer writing short fiction over novels, and if so, why? 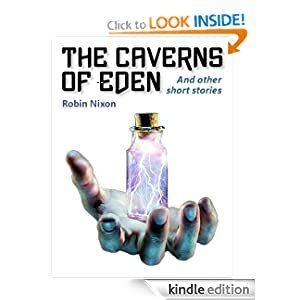 Mostly I write factual books on technology and motivation (see http://amazon.com/author/robinnixon), but in my spare time I am starting to write these short stories, and am considering turning The Caverns of Eden short story into a novel, as I want to take the characters and story a lot further. Which short fiction writers have most influenced you. Just what price to you set for a short story? The answer is – there really isn’t an answer. It gets debated a lot but a concrete answer never gets settled on. One of the big challenges is that there are plenty of people out there who offer novels at $0.99, or even for free, and of course then readers ask why should they buy a short story when they can get a full length novel instead? I’d say because short stories are better, but I may be accused of bias. For myself I go the following way. But what works for one person doesn’t always work for everyone. Having finished off a novella last month, I started work on the next of the (long) list of planned stories. Somehow it turned into working on the next four stories, all at once. Keeps me on my feet a little. All four are planned as novelettes, and progress so far on them would indicate that they should be around the 8-12K mark each. I am hoping to try and get them all finished this month, though schedules don’t always go according to plan. The one I first started on, entitled ‘The Rose of Nakunwe’, is the next in the gunpowder fantasy collection, and the second in a planned sub-series of The Commonwealth Chronicles. It has been fully planned out and is about half way through the first rough draft. The other three, none of which yet have names, are the next three sword and sorcery novelettes in The Deeds of Peregrine & Blade series, the first collection of which came out recently. The first two are planned and half written up, while the third is only half planned, though that half has also been written up. So back to the writing – I have to get the rough drafts out of the way in readiness to commence the rewrites. When I set this blog up, it was with the mind to help promote and encourage short fiction. Except I haven’t done a lot of that to date, so it is time to return to the purpose of the blog. What I am looking to do is is showcase works of short fiction by indie writers in the sf/uf/fantasy and related fields. By showcasing I mean having a post on the story, a blurb and link, and some optional questions if the author feels like that. My interests in reading are mainly towards sci-fi and fantasy, which is why they are the ones I’d like to showcase, across a number of genres, whether space opera, hard sci-fi, cyberpunk, steampunk, sword and sorcery, high fantasy, urban fantasy or paranormal. There won’t be reviews – at least not yet. I have never been good at such subjective things. A simple yes or no I can handle, but rating something out of 5? I’ve never managed that well. If you are interested, check out the submissions page and drop me a line. 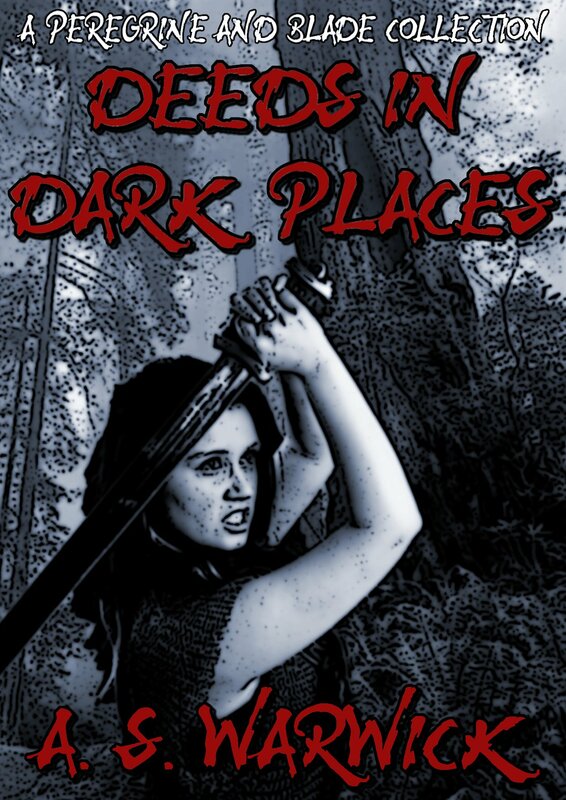 My latest collection, Deeds in Dark Places, has just been released on Amazon, a collection of three sword & sorcery style fantasy novelettes, totalling 27,000 words between them, inspired by such old time pulp writers as Robert E. Howard and Fritz Leiber. They are fun, low fantasy adventure stories; no saving the world, no epic quests or epoch changing events. Just simple adventurers seeking fortune and glory. This one is only on Amazon as I’m trialling out the new KDP Select offer. In addition, for 5 days, until the 13th, it is available for free to download. In a world ancient with civilisations, where ruins and mysteries and monsters abound, the adventurous thrive. Sell-swords, mercenaries, corsairs and more, Fianna and Carse of the Red Blade have been all of these. Better known to many as Peregrine and Blade, they are a most unusual pairing. Fianna, a sword-maiden of the wild Aedring hill clans, and Carse, the urbane, educated man of the civilised cities, a dabbler in the Mysteries and sometimes assassin, are a far cry from one another. Assassins, sorcerers, corsairs, the undead and more, all are but a few of the obstacles they face in their search for wealth and glory. Success is hard won, and oft times fleeting. I’m already working on the next collection of three stories, with notes for more beyond that. The link to Amazon is here. And already we are a week into the new year. This year I am hoping to pick things up a bit, both with writing, sales and of course this site. I’m terrible with resolutions – more specifically terrible with keeping them – so it is more a case of having a few wishes I’d like to accomplish. Firstly, dependent on scheduling and other time constraints, I’d like to write a short story a week. It may take a bit longer to release them, but that is the goal. Hopefully I can also squeeze a novella or three in there as well. I also hope to update this site far more often, including the original plan of encouraging short stories and novellas, either by reviews or simply sharing them. So, without further ado, lets get the show on the road. It is November 1st here in Australia and I am about to commence an attempt at NaNoWriMo. For it I have gone with the Steampunk flavoured anthology. I am planning on three stories as of yet unknown length. The first and third ones have been planned out, but the second one is still just a concept – I’ll have to come up with something for it when the time comes. So far titles are just working ones. Sir Richard Hammerman; Gentleman-Explorer. A typical reserved, stiff-upper-lip gentleman of Albion, unflappable in the face of danger. Obadiah Crabb; Sir Richard’s loyal and dependable manservant. Doctor Hamilton Gooding; Scientist, naturalist, explorer and inventor from Scotti. Captain Archibald Hammerman; Sir Richard’s genial brother and somewhat the back sheep of the family. They bought him a commition in the army to keep him out of trouble. Lady Adeline ‘Ada’ Redsmith; A daughter of an old friend of Sir Richard and Captain Archibald’s father. Raised in the colonies and as such is a more adventurous and outgoing woman than the genteel society ladies of Londinium. Sir Richard and Doctor Gooding set forth from Cape Colony into the wilds of Africus, into pygmy territory, seeking a lost temple. The region is fraught with peril as it is said that the pygmies have discovered a means by which to animate the bodies of their fallen foes to fight for them. Doctor Gooding’s research into some recently discovered ancient stone tablets is interrupted by agents of the Frankish Sun King. It is up to Sir Richard and Captain Archibald to recover both the good doctor and the tablets before they can be spirited away back to Eupora. Travelling back to Albion via airship and escorting the Lady Adeline Redsmith is no easy task when pterodactyl riding pygmies, djinn dervishes and Transylvanian sky-pirates all seek to thwart the journey of Sir Richard, Captain Archibald and Doctor Gooding. NaNoWriMo is upon us again soon. The funny thing is, despite having known about it for years, last year was the first time I attempted it – and never completed it. I got some 17,000 words in and decided that I shouldn’t be working on a new project when old ones still remained to be finished. So it got set aside, as often happens. At least this time the projects I returned to did get finished. In part that is why I like short stories – after 10-15,000 words you are generally finished. This year I am contemplating doing it again – but not with a novel, as is the norm. Instead I am thinking of doing an anthology of short stories. The question is which, as I have a few planned. The first is one I’ve already written six short stories for and was planned to be one of the next things finished after the re-editing and new covers were done for the previous stories. There are three more stories planned for the anthology, though I am not sure if they can be stretched to 50,000 words between them. The second only has one story written so far – and another half done. It had been planned as a novella but may end up being a bit longer, given it is already 40,000 words in length. Four novelettes and a novella are planned to finish of that anthology, so it could easily hit the 50,000 word mark. The third is a anthology of pulp style sword and sorcery fantasy stories – three have been written (but not yet published) with a number more planned. The good thing about them is that they are fairly fun and easy to write and don’t require a huge amount of planning. The last one is an anthology I’ve been wanting to write for a long time but never gotten around to it – a steampunk series set in a fantastical alternative Earth, following the exploits of a gentleman-adventurer and his companions as they battle pterodactyl-riding pygmies while travelling aboard airships, find lost treasures in hidden temples in the deep jungles, get caught up in the politics of the Immortal Queen Victoria of Albion as she seeks to defend the Empire against her foes in Europa and all the weird science and outlandish steampunk contraptions that go along with it. I still have a few weeks to go luckily before a choice needs to be made. Books used to once be a luxury item – only for the rich and powerful – as each one had to be written out by hand. Then came the glorious invention of the printing press, which opened up books to the masses. Short Stories were around the whole time – and indeed earlier, back to oral-telling traditions. Their height lay in the time period between the 1890s and 1950s – the pulp magazines. They worked on the principle of being cheap – cheap pulp paper (hence the name), cheap ink and cheap authors. Best remembered for lurid stories and sensational cover art, they proved a staggering success. There were dozens of them, often specialising on a specific genre. Their peak was during the 1920s and 30s, when some titles were selling up to a million copies and issue. They were a cheap method of escapism from the difficulties of the time. The pulp format sadly declined after that, as competition from other sources began to eat away at it – radio, comics, movies, television and the paperback novel. The collapse of the pulp industry had a terrible effect on short stories – they were its single largest outlet for them. Writers who had supported themselves writing shorts had to look elsewhere, such as novels. That was the past though. The future is now. Economic rationalism shunted short stories aside in favour of longer and longer novels – until a new player emerged on the scene. Ebooks. Once more short stories can be economically viable. Once more the pulps are viable. A monthly collection of short stories would be an ideal way to share the joys of short stories again, to introduce new writers and of course to entertain people who live busy lifestyles – and it could be done cheaply and sold cheaply, just like with the old pulps. I have heard that there are a few already out there, which I do plan to check out at some stage. Keep an eye out though; we could see the pulps and short stories make a big come back – and everyone would be the better for it.